With snow in the forecast for this week, you might not be thinking about summer. However, if you want to take part in some top rate professional development in the summer months, now is the time to be looking. The National Endowment of the Humanities (NEH) Summer Seminars and Institutes are amazing professional development opportunities for social studies and humanities teachers. With almost three dozen different seminars, there are plenty of topics to choose from – and some of them will be of particular interest to civic educators. I’ll give you a quick rundown of a few of the seminars that caught my attention, and if you read to the bottom of the post I’ll link to the full list of topics. What is an NEH Summer Seminar and Institute? These summer institutes are intense seminars hosted at institutions of higher learning or historic landmarks, facilitated by some of the leaders in their fields, and funded by the National Endowment of Humanities. Each seminar runs one to four weeks, and participants are granted a stipend that varies with the length. This stipend is intended to cover your travel, lodging, and expenses throughout the institute. You’ll also be provided with the books for the seminar free of charge. One of the nice things about these institutes is that if you can save money on housing, you can keep the leftover money from the stipend. 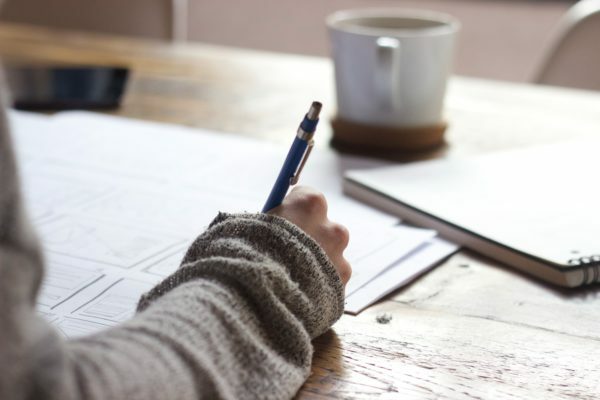 If money is tight in the summer – and let’s be real, what teacher doesn’t need some supplemental income in the summer – this can be a great way to help budget for the summer. In my case, I attended an NEH Summer Seminar on Race and Politics in the Civil War at the New York Historical Society in 2014. I was able to commute from home in New Jersey to the NYHS in the city, and that allowed me to pocket about $1,000 that helped me get through to September. The seminar itself was amazing. We had a great facilitator, and we were visited from leading civil war historians like Eric Foner. We took a tour through the city, to learn about New York City’s part in this story. The other participants were awesome; we had a great time learning together and developed lasting professional relationships that broadened my network. These are wonderful opportunities, and if you’re fortunate enough to be selected to attend one you should absolutely take the opportunity. And with that being said, let’s take a look at a few of this year’s seminars. They all look amazing, but I’m going to focus on the ones that more directly relate to one of the major themes that I use in teaching history: civics and government, equality and social change, movement of people, conflict, and economics. Study the Lowell textile mills at this Institute. Participants in this Landmarks Workshop examine Lowell’s textile industry as a case study of early 19th-century industrialization and reform. We use the resources of Lowell National Historical Park and other cultural/historical sites to address changes in work, society, culture, and the environment between 1820 and 1860, as well as reform activity related to labor, women’s rights, and slavery. This topic is a great way to explore the themes of economics and how money is distributed in society. It’s also a great way to think about equality and social change. There are also some great historic sites to explore as part of this seminar, and you’ll surely get some resources to help make this part of American history come alive for your students. This seminar is hosted at the Tsongas Industrial Historic Center, a partnership between University of Massachusetts at Lowell and the Lowell National Historical Park. It’s a week long, and it’s offered over two different weeks: June 23 to 28 and July 14 to 19. Read more about this seminar on the Lowell textile mills here. The last spike being driven into the Transcontinental Railroad, the topic of this NEH Summer Institute. 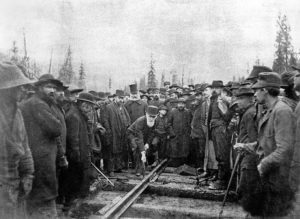 We will explore how the Transcontinental Railroad inaugurated national transportation and communication networks, a national marketplace for the passage of goods, a much larger-scaled industrial capitalism, and a larger-scaled labor movement to oppose it. The rail line made possible the mass settlement of the West and changed the course of American history. We will come to see the railroad as the connection between economic, social; environmental, and cultural systems, and as a useful device for teaching the era. This looks like a really interesting topic that uses the transcontinental railroad as a lens through which to explore American history. It would be an excellent way to explore the theme of movement and the effects that the movement of people and goods have. But it will also be interesting to think about how these things relate to critical questions in economics – like who is rich, who is poor, and who benefits from these massive changes and developments. This seminar is hosted at the University of California: Davis campus. It’s a week long, and it’s offered over two different weeks: June 23 to 28 and July 7 to 12. Read more about this seminar on the Transcontinental Railroad here. 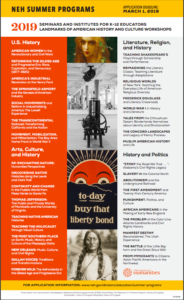 The institute offers teachers an exploration of one of the most transformative moments in American history when America became truly modern and so many of its intellectual and political legacies remain alive today. Teachers will deepen their knowledge and understanding through readings, discussions, lectures, and visits to landmark historical and cultural resources across Chicago. I couldn’t think of a better topic to use to explore issues related to economics and to how wealth is spread out in our society. It would also be harder to find a time period with greater parallels to our current climate, with continuously increasing economic inequality. 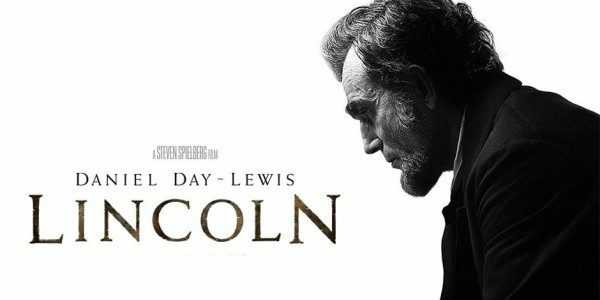 Unfortunately, this is also a topic and a time period that can get left out of the curriculum if you split United States History into two parts – it falls in that nebulous time period between U.S. History 1 and U.S. History 2. This seminar is hosted at Loyala University Chicago. It’s four weeks long, from June 30 to July 26. Read more about this seminar on the Gilded Age here. The painting, Manifest Destiny. What did this mean for Utah? 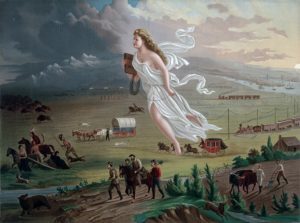 Manifest Destiny Reconsidered: The Utah Experience complicates the standing narrative of western expansion through intensive study of Utah migration and settlement from 1847-1869. It also investigates how the emerging nation tried to define what it meant to be “American,” with a focus on immigration, religion, race, gender, and class and on how such issues continue to shape current political and social debates. This is another interesting seminar that focuses on movement, but it appealed to me because it also gets to the core theme of what it means to be “American.” The setting is also interesting, as Utah often gets a superficial coverage in the curriculum. Another appealing piece of this seminar is that you’ll get to visit some historical sights and monuments in Utah, and exploring new places is always a highlight for me. This seminar is hosted at the University of Utah. It’s a week long, and it’s offered over two different weeks: June 16 to 21 and July 7 to 12. Read more about this seminar on Manifest Destiny and Utah here. The Battle of the Little Bighorn and the Great Sioux War (1876) offers educators rich perspectives through a wealth of historic and cultural primary sources including historic for the study of human conflict as seen through the eyes of those who were involved through the generations. This seminar deals with a common theme in history – conflict – but it does so through a conflict that is often overlooked. The Great Sioux War is often lost in the transition from U.S. History 1 and U.S. History 2, with the first course ending somewhere around the Civil War and Reconstruction and the second course picking up with the first World War or the Great Depression. But this is a pivotal conflict in America’s history, and this is one of many reasons that thematic approach to history would better serve our students than a traditional chronological approach. This seminar is hosted at Montana State University Billings. It’s a week long, and it’s offered over two different weeks: June 16 to 22 and July 7 to 13. Read more about this seminar on the Great Sioux Wars here. Slavery in the Colonial North explores both the institutional and personal sides of enslavement, understanding how slavery emerged under Dutch law and expanded and became codified under English rule. The institute presents the institution of slavery as interwoven throughout colonial development, as opposed to its usual compartmentalization in the antebellum South. There’s hardly a more suitable topic for exploring the theme of equality – and the history of inequality in the United States – than that of slavery. It’s an oft-covered topic and it’s something you’ve probably got plenty of resources about already. But what’s interesting about this seminar is that it focuses on slavery in the North instead of in the antebellum South. Too often, the curriculum elides this touch subject and students may be left with the oppression that it was only in the South that a sizable portion of the American population was held in chattel slavery. This also offers a novel way to approach the subject with students who feel they’ve already “covered” it in earlier courses. This seminar is hosted at Historic Hudson Valley. It’s one week long, from July 14 to 20. Read more about this seminar on slavery in the North here. View the full-size poster of offerings here. This is only a small taste of what the National Endowment of Humanities has partnered with local institutions to offer this summer. Other topics include the Lewis and Clark expedition, Shakespeare, Native American Histories, the Holocaust, Punishment, and so much more. Head over to the National Endowment for the Humanities website to browse the complete list of 35 seminars and institutes being offered this summer. But don’t wait too long. Applications are due March 1. But if one of these topics piques your interest, or you’ve attended an NEH Seminar in the past, leave a comment below. We’d love to hear what you think.